Where is SkyPark located? How do I get there? How far from the San Francisco International Airport (SFO) is SkyPark located and when should I arrive? 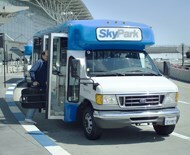 How often do SkyPark shuttle vans run to/from the Airport? What should I do when I arrive back into San Francisco International Airport (SFO) from my trip? How do I get back to my car? How long will I have to wait for a pick-up at the airport by a SkyPark shuttle van? Why do I have to call SkyPark with my claim check number when I arrive back at the airport? What are SkyPark’s hours of operation? What are SkyPark’s parking rates? What if I want to park my own vehicle? Do you offer parking for motorcycles? What other services does SkyPark offer? What if my flight is cancelled or my trip gets delayed? What happens if I find damage on my car? Can SkyPark charge electric cars? How long can I leave my vehicle at SkyPark? How safe is SkyPark’s facility? Does SkyPark have a frequent parker club? What if I forgot my SkyPark Express Club #? Does SkyPark offer discounted rates to corporate accounts? Can I park vans, trucks and oversized vehicles at SkyPark? What types of credit card payment do you accept? Does SkyPark have an app I can use on my phone? Does SkyPark have accommodations for disabled customers? SkyPark is located at 1000 San Mateo Avenue, San Bruno, CA 94066. Click here for directions. When you return from your trip, please retrieve your luggage first and then call our toll-free number at 1-800-244-PARK (7275) and give the operator your claim check number. Go outside on the departure level and look for the signs for “off airport parking.” If arriving at Terminal 2, cross the street and wait by the blue and red striped curb. For all other terminals, cross the street and wait by the blue and white striped curb. Within minutes, a SkyPark shuttle will pick you up and bring you back to your waiting car. We dispatch a shuttle as soon as we receive your call for pick up, so SkyPark’s pick-up time is typically 5 – 10 minutes. To expedite the check out process, you can join SkyPark’s Express Club and register your credit card. When you call for a pick up at the airport, we will process your ticket while you are on the shuttle and your receipt will be waiting for you in your car. Click here to become an Express Club member. Our shuttles run continuously 24 hours a day, but since SkyPark is a valet parking facility, calling ahead allows us to retrieve your car while you are on the shuttle and have it waiting for you when you arrive. This saves you time on your return trip! The SkyPark parking facility is open and our shuttles run 24 hours a day and 365 days a year to serve our customers. Please visit our Rates and Discounts page for current rate information. Save money by printing out our SFO Parking Coupon. 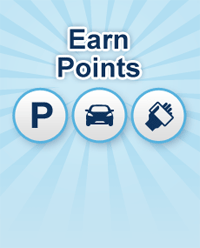 Join the SkyPark Express Club and earn points each time you park that can be redeemed for parking or car care services. No, we do not accept competitor coupons at this time. Reservations can be cancelled or changed up to 24 hours before the start of the reservation. Your deposit will be credited to the card you used to place your reservation (if any was collected). At the bottom of the confirmation email, click on the link that says “To cancel your reservation, click here”. At the bottom of your online Reservation Summary, click the button that says, “Cancel this reservation”. You can also click here to search for your reservation. You will need your Reservation Number and e-mail address to access your reservation. You’ll have the option of canceling when you are viewing your reservation. We’re sorry, but SkyPark is a valet parking facility only. Yes, we do! This is the only instance when we allow owners to self-park. SkyPark offers car washing, detailing, oil change and other automotive services. Please visit our Car Care Services page to get pricing and more detailed information about scheduling these services. If your flight is cancelled before you ever start your trip and your car is parked with us for less than four hours your parking will be free. If catching a flight later in the day we will issue you a new ticket when you come back to park with us. However, if your trip gets delayed once you’ve departed SFO due to weather or other circumstances you will be charged according to the length of time your car is parked with us. SkyPark provides free battery jump-starts and pressurized air to fill your tires. Please inspect your vehicle before you leave our facility. If you find damage, please report it to the shift supervisor and complete an Incident Report. We will contact you after a thorough investigation. Claims made after the car has exited SkyPark will not be honored. We have complimentary Level 2 Chargers that charge at 240 V and are equipped with J1772 plugs available for customers parking their vehicles indoors. A 24 hour stay is required. Tesla owners please be sure to leave your adapter. You can leave your vehicle as long as you wish. However, if you plan to leave your vehicle for longer than 30 days, you will need to make arrangements with us in advance, so we would not need to report as possible stolen or abandoned vehicle to the proper authority. Cars staying over 2 months will be required to pay for the first month in advance and leave a credit card on file for subsequent billing. Yes! Join the SkyPark Express Club for FREE and earn points each time you park that can be redeemed for free parking or car care. Click here to be taken to the Account Management page where you can login. Once you have logged in, click on the “Edit Profile” link on the left hand side and your Express Club # will be stated at the top of the page. If you do not have a tag on your car with the vehicle #, please call customer service at 650-875-6655 and we can look up your Express Club # for you. Yes, please visit our Corporate Accounts page for more information and to send us information about your company. SkyPark logs all lost & found articles and keeps these items under lock and key. Please call 650-875-6655 or email us at info@skypark.com to inquire about any lost items. Can I park vans, trucks, full size SUVs and oversized vehicles at SkyPark? Yes, we can accommodate vehicles that are over sized in our outdoor surface parking area as long as it’s not during a peak period. Dual axle pick-up trucks and other over sized vehicles will not be eligible for car care services and the same may apply to full size SUV’s during peak periods. Motorhomes or other large vehicles cannot be accommodated. Please call for availability. There may be an additional fee depending on size. We accept all major credit cards: AMEX, VISA, Master Card & Discover. Yes, SkyPark has an app! With the app members can request a car for pick up, view past receipts, book reservations and view account and points. To download the app for Apple devices, click here. To download the app for android devices, click here. Yes, we can take you to your terminal and pick you up using your own vehicle. Please call in advance to request this service. Please inform our attendant when you arrive that you’ve requested this service as well as when you call for pick-up at SFO. There is no additional charge for this service.